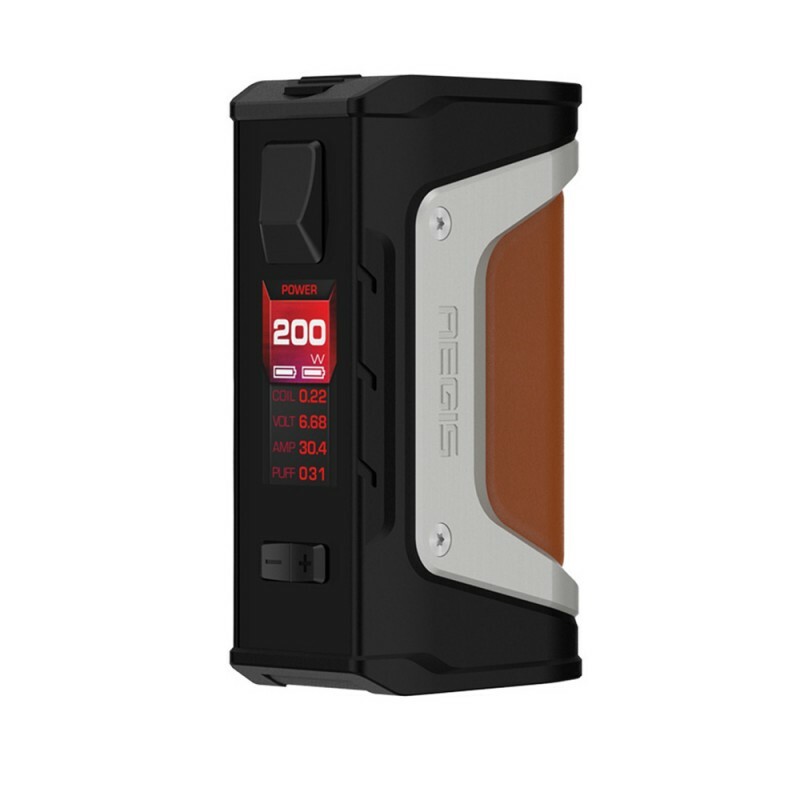 The Aegis Legend by is a second generation box mod by GeekVape featuring military standard 810G-516.6 shockproof and IP67 waterproof & dustproof housing, with this version using dual 18650 cells (not included, sold separately) to deliver up to 200W of power to atomizers ranging from 0.05Ω - 3.0Ω. The advanced AS chipset supports temp control for Ni/SS/Ti/Ka with TCR customization and bypass mode, as well as a VPC system which allows you to set a custom power ramp curve, independantly adjusting the power level for each of the first 5 seconds of draw. Options are viewed on a bright 0.91" OLED display. The Legend is styled after the original Aegis mod, with a slightly longer and more narrow c-frame body but almost identical shaping. The stiched leather backing is comfortable to grip, and the oversize firing button is highly responsive with a solid click. The micro USB port supports firmware updates and charging of the cell (external charger is recommended), and is safely covered with a silicone tab for security of the housing. Cells are accessed via a bottom battery door that is also heavily lined to prevent water damage.